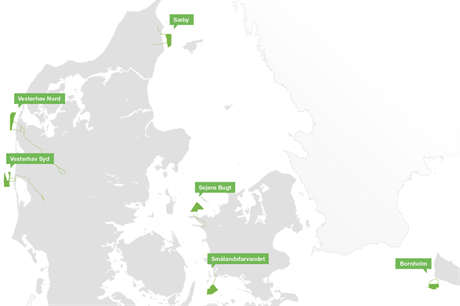 DENMARK: The tender for 350MW of nearshore projects in Denmark has been postponed by one month for clarification of bird protection concerns and remedial measures. The Sejero Bugt project, near the Island of Sejero to the northwest of Zealand, east Denmark, is close to a reserve that is home to a species of black duck. The environment impact assessment report, published by the Danish Energy Agency (DEA) in December, found that the project could go ahead in a restricted area and with certain remedial measures, according to the DEA. Researchers from Aarhus University and consulting company Niras had reassessed environmental studies for the proposed site, which could accommodate 200MW of wind power. The experts could not rule out the project would have an affect on the bird population. A third party review of the methodology of the EIA reports will now take place, causing a delay to the tender. "Since the case has delayed the time when DEA may publish the final contract documents, and thus how long the bidders have to prepare a bid, the energy, power and thermal minister decided to postpone the deadline for bids to 4 May until the consequences are clarified," the DEA said. The DEA is holding an auction for up to 350MW of capacity, across six potential nearshore projects. Three companies and consortia were shortlisted for the programme: Vattenfall, a WPD-Hofor joint venture and a European Energy-led consortium. Sejero Bugt is one of the six nearshore project names. The others will be called: Vesterhav Nord, Vesterhav Syd, Saeby, Smalandsfarvandet, and Bornholm.